The Mares Loop 72x Regulator combines the new for 2019 Mares 72x First Stage with the outstanding Mares Loop 2nd Stage to create a regulator that excels in every department. Looking for your next regulator? You might have just found it in the Mares Loop 72x Regulator. The 72x 1st stage comes jam packed with amazing features to ensure you have every base covered. Mares have been developing world class dive equipment for years, but the Ultra 72x is next level. 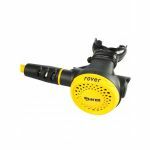 It has four vertical and four radial low pressure ports (patent pending), all of which come with natural dynamic flow control, to make the 72x 1st stage one of the most adaptable to hit the dive market in years. All of the high pressure ports come pre-orientated which helps to create a better angle for your hose, stopping kinking and ensuring you don’t lose any hose length. The 72x also comes with auto sealing technology (AST), which creates a 1st stage dry system to keep it dry at all times. This helps to prevent ice build up in colder conditions, keeping your regulator protected. The 72x is a diaphragm regulator, making it more reliable in colder water and easier to keep clean. The compact dimensions of the 1st stage make it easy to attach and won’t clutter the rest of your set up. The pearl chrome finish on the 72x gives it a sleek, stylish design which will help you to stand out from the crowd. The Mares Loop 2nd stage is one of the most versatile 2nd stages available from any dive brand. Coming with an “under the shoulder” hose position, it gives a comfortable and useful alternative to a traditional hose position. As well as this the Loop can be mounted on the right or left side, giving you freedom and changeability which is essential to any modern diver, recreational or technical. This combination allows for freedom of movement in all directions. The Loop also comes with an oversized silicone purge button which is easy to access at all times and easy to use, meaning purging your reg will never get easier. The Loop’s twin exhaust valve is super effective and expels any excess air easily. Coming in DIN or A-Clamp (INT), the regulator weighs between 1kg to 1.26kg including the hose, dependent on the set up. As with all Mares Regulators, the Loop 72x comes with a vortex assisted design, this helps to make breathing through your regulator easier whatever the depth and density of air. The regulator is also perfect to pair with an octopus, you can see a variety of octopus options when purchasing this as part of our Mares Loop 72x Regulator reg package which includes a gauge and octopus. Under the Shoulder Hose Position - The “under the shoulder” hose position the Loop provides a comfortable and useful alternative to a traditional hose position. Left or Right Side Mounting - As well as this the Loop can be mounted on the right or left side, giving you freedom and changeability which is essential to any modern diver, recreational or technical. Freedom Of Movement - This combination of hose position and mounting allows for unparalleled freedom of movement. Twin Exhaust Valve - A twin exhaust valve on the Loop expels air quickly and easily for effortless breathing. Oversized Purge Button - The Loop also comes with an oversized silicone purge button which is easy to access at all times and easy to use, meaning purging your reg will never get easier. Who is the Mares Loop 72x Regulator For? The Mares Loop 72x Regulator combines a high quality, high performance 1st stage with a versatile 2nd stage to create an outstanding regulator set up. The 72x 1st stage satisfies all of your performance needs while the Loop 2nd stage lets you do you and dive the way you want to.